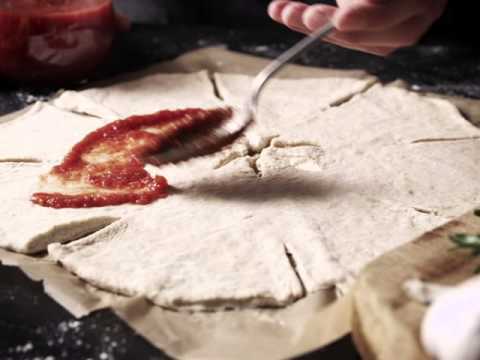 Take part in a shareable treat of astronomic proportions with our Star Shaped Pizza recipe. Delicate flavours from a topping of fresh greens, herbs and dry-aged prosciutto work in tandem with a coating of smooth soft white cheese. Outfitted with a centre of velvety decadence, our Castello® Extra Creamy Brie puts the finishing touch on this unique take on classic pizza. Easy, fun and engaging for both children and grown-ups, our Star Shaped Pizza makes for a hands-on snack or a full-blown meal. As leftovers at lunch, it is the perfect go-to option when looking for a quick bite to eat whether enjoyed hot or straight out of the fridge. Enjoy! 1. Prepare the pizza dough according to the instructions. Combine the potatoes with the olive oil, salt, pepper and rosemary. Bake the potatoes in the oven at 200°C for about 30 minutes or until tender. 2. Roll out the dough into a circle on a floured surface. Carefully move the dough onto a piece of baking parchment. Make 8 cuts in the dough all the way around, from the outer edge of the dough in towards the centre. Each cut should be about 6cm long and should not extend all the way to the centre. Then, make 8 small cuts about 2cm long from the centre of the dough out towards the edge. 3. Spread tomato sauce over the part of the pizza base that has not been cut through. Arrange the potatoes, red onions, prosciutto and cheese in a circle on top of tomato sauce. 4. Starting from the outer edge of the dough, lift up each corner where you made the cuts. Fold the corners towards each other so they partly cover the filling and form a triangle. Then, lift up the corners of the dough along the cuts in the centre, folding each one up and out to cover the filling as well. Preheat the oven to 250°C and put an empty roasting pan in the oven. 5. Carefully move the pizza on the baking parchment into the hot roasting pan. Brush the pizza with egg yolk and bake in the middle of the oven at 225°C for about 20 min. or until crispy and golden. 6. Sprinkle with chopped fresh parsley and serve. Enjoying your meal to the fullest is a lot easier with the right beverage. Whether you prefer beer or wine, their flavours should always look to complement the character of your dish through contrasts. Some beers might not be strong enough to counterbalance the creamy textures from the cheese and might feel muddled or underwhelming. On the other hand, some wines might be too intense, in turn overpowering all traces of any subtle nuances. In the end however, choosing what you want to pair your dish with is ultimately up to you, but finding the perfect match is sure to elevate your experience to new heights.